WICKED, the West End musical phenomenon that tells the incredible untold story of the Witches of Oz, is delighted to announce the opening of its 21st new booking period, on Monday 1 February 2016 at 10am, with over 500,000 new tickets going on sale for performances until Saturday 29 April 2017. 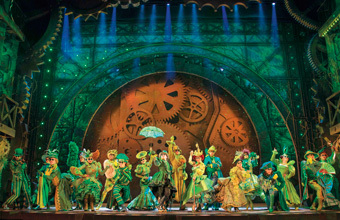 Acclaimed as"a magical story of friendship, love and growing up" (OfficialLondonTheatre.com) and "a package of show-stopping songs and razor-sharp wit" (Metro), Wicked has now been seen by over 7 million people in London alone and is currently the 9th longest-running show in the West End* and already the 19th longest-running show in West End theatre history*. *Information verified by The Society of London Theatre. *Tom McGowan is appearing with the support of UK Equity, incorporating the Variety Artistes' Federation, pursuant to an exchange program between American Equity and UK Equity. Based on the international best-selling novel by Gregory Maguire that ingeniously re-imagined the stories and characters created by L. Frank Baum in 'The Wonderful Wizard of Oz', Wicked tells the incredible untold story of an unlikely but profound friendship between two sorcery students. Their extraordinary adventures in Oz will ultimately see them fulfil their destinies as Glinda The Good and the Wicked Witch of the West. Wickedhas music and lyrics by multi Grammy® and Academy® Award-winner Stephen Schwartz (Godspell; Disney's Pocahontas and The Hunchback of Notre Dame) and is based on the novel 'Wicked: The Life and Times of the Wicked Witch of the West' by Gregory Maguire and adapted for the stage by Winnie Holzman. Musical staging is by Tony® Award-winner Wayne Cilento and the production is directed by two-time Tony® Award-winner Joe Mantello.